Welcome to this year's 15th issue of DistroWatch Weekly! Software is constantly changing, new features are added and security holes are patched. Virtually every operating system connected to the Internet will receive a regular stream of new packages in an effort to keep up. All of these changes and upgrades are a problem for administrators who crave reliability and openSUSE is hoping to address that with their new Transactional Updates. These updates should be atomic, reversible and can be managed using the existing openSUSE tools. We have more details on openSUSE's Transactional Updates in our News section. Plus we talk about LibreELEC expanding and looking for help building and testing their many device images. We also report on SUSE Linux Enterprise getting official support on the Raspberry Pi, SparkyLinux reducing the number of editions it provides, and Fedora phasing out Python 2. First though, we turn our attention to a small, UNIX-like operating system called Sortix. The Sortix project may lack some modern features, but it is small, fast and well documented. We have more on this young operating system in our Feature Story. Then, in our Questions and Answers column we talk about where to find collections of portable packages in the popular Flatpak, AppImage and Snap formats. We are also happy to share the releases of the past week and provide a list of the torrents we are seeding. In our Opinion Poll we ask how long you have been running your current operating system. Are you content to stick with one OS for a while or do you prefer to hop around? Whatever your distrohopping style, we wish you all a fantastic week and happy reading! Opinion poll: How long do you run the same distro? Sortix is a small self-hosting operating system aiming to be a clean and modern POSIX implementation. It is a hobbyist operating system written from scratch with its own base system, including kernel and standard library, as well as ports of third party software. It has a straightforward installer and can be developed under itself. Releases come with the source code in /src, ready for tinkering. Sortix is available in 32-bit and 64-bit builds for x86 systems and the whole operating system (kernel, command line utilities, installer and source code) is available as a single 70MB download. Booting from the downloaded ISO brings up a boot menu where we can choose to start a live session of the OS or launch the project's installer. Taking the live session option boots us to a text console with the Sortix logo displayed at the top of the screen. We are automatically logged in as the root user. A quick look around the command line interface reveals that Sortix includes most of the standard UNIX command line programs such as ls, cat, man and cd. This allows us to navigate the file system, which shares the same layout as most Linux distributions and the BSDs. There is a welcome text file in the root user's home directory which tells us we can run "man installation" to get advice on setting up the operating system on our hard drive. We are also told to run "man user-guide" to get introductory information on navigating and using Sortix. The Sortix shell looks and acts like the Bash shell and accepts control characters such as Ctrl-C to terminate a process and Ctrl-L to clear the screen. We can use the up/down arrows to access our past command line history. 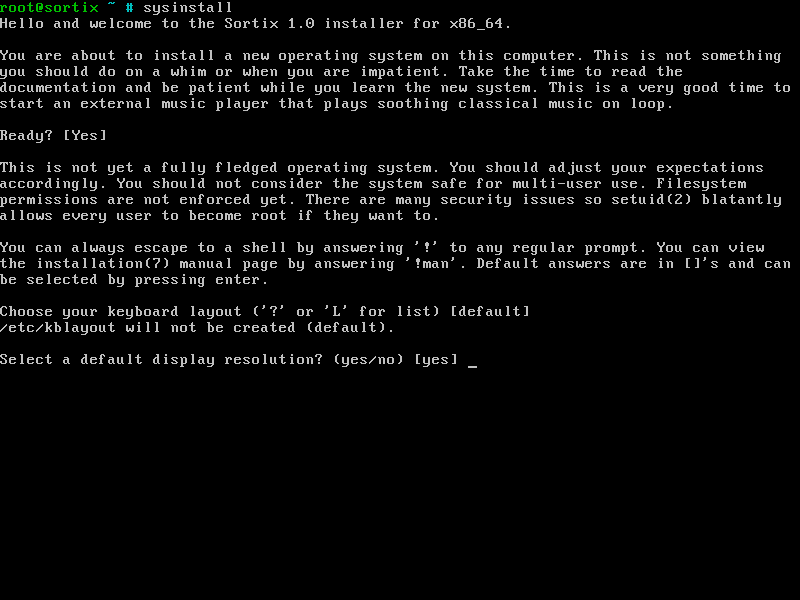 Sortix's installer can be accessed through the boot menu or by running sysinstall from the live environment. The installer's steps are outlined in a manual page and in the on-line documentation. 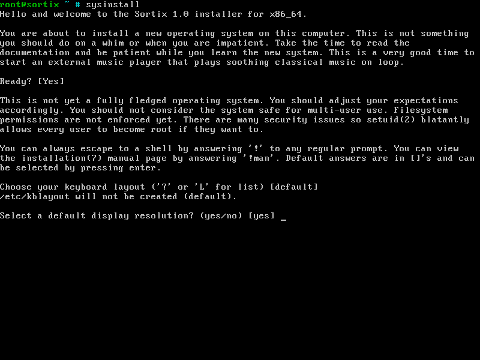 The installer is text-based and begins by warning us of some of Sortix's shortcomings. For example, Sortix features file system permissions, but they are not enforced and user programs can gain root access by calling certain functions. In other words, Sortix has several features, but still lacks security and people should not run it on multi-user systems. The installer walks us through selecting a keyboard layout and screen resolution. We can choose where to install the GRUB boot loader and then the installer runs a command line partition manager called Disk Editor (disked). Disk Editor has some good points and some rough edges. For example, I like that typing "man" in Disk Editor opens its manual page so we can learn how to use its options. I think that is a great feature. However, I found Disk Editor does not recognize partition or device names and we need to reference partitions by their index in Disk Editor. This means if we have three partitions (ata0p1, ata0p2 and ata0p3) we must refer to ata0p2 as "2" and not "ata0p2" because it is the second one in the list. At first Disk Editor did not know how to work with the ext2 partition I had set up ahead of time and I had to delete it and create a new partition using Disk Editor and assign it a mount point. After that the installer copied its files to the hard drive, a process which took approximately 15 seconds. Then we can set a password for the root account and, optionally, create more user accounts on the new system. The installer then finishes and we can exit our shell to reboot into our new copy of Sortix. The live system does not recognize commands like "reboot" or "halt". The first time I installed Sortix the system failed to boot or even display the boot loader screen. I went through the installer again and, the second time through, I ended up with a working system. As far as I know I applied all the same configuration options during both attempts. Sortix takes about one second to get from the GRUB boot loader to a graphical login screen. It's an impressive feat and, when shutting down, the operating system halts in about one second as well. 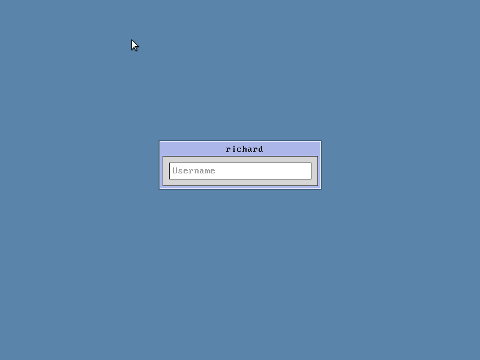 From the login screen we can sign into a user account which will present us with a command line interface. We can also try to login using the names "reboot" or "poweroff" to shutdown the operating system. These power management account names do not require a password. Sortix runs very quickly, completing most simple commands almost instantly. If we do not look closely, working from the Sortix command line feels a lot like using Bash on a Linux distribution or one of the BSDs. It was only when I looked closely at a command's output or tried to run a program that was not available on Sortix yet that I was reminded I was running a young, hobbyist system. One of the big missing features at the moment is, unfortunately, network support. 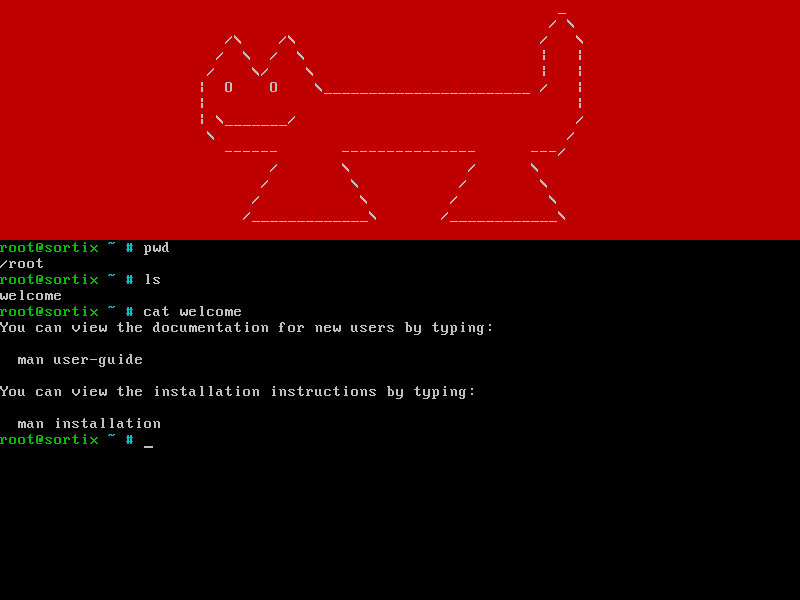 Sortix has a lot of command line tools, a working shell, manual pages for most commands and even some graphical programs (including a copy of the Asteroids arcade game), but the operating system cannot connect to networks. This means we can test POSIX tools, compile software and explore the source code of this small operating system, but we cannot browse the web, exchange files or check e-mail. Sortix is a light operating system. A fresh install only uses about 476MB of disk space and 25MB of RAM. It runs very quickly, but the flip side to that is Sortix uses 100% of the CPU the whole time it is running. The kernel does not yet know how to scale back its CPU usage. There are some other limitations, for instance Sortix does not yet have USB support. This means, unless we are running quite old equipment, it will probably be difficult to use a keyboard or mouse. These issues can be side-stepped by running Sortix in a virtual machine. One thing which pleasantly surprised me about Sortix is the operating system is well documented. It looks as though the main developer has written all new manual pages for each home grown program (some GNU programs were imported with their own manuals) and they are generally easy to read. The manual page for Sortix's text editor is a particularly good example. Open source projects are notorious for not including useful manual pages and I was happy to see Sortix not only includes documentation but the text is presented in a way that someone who has not written their own operating system from scratch can understand. Speaking of developing an operating system from scratch, Sortix may not yet be a practical system to use day-to-day, but it does come with a complete set of source code. This means we can explore how the kernel and utilities were put together without downloading anything new. all system source code is kept in the /src directory. A compiler and related build tools are included too in case we want to try our hand at editing and building some of the source code. Sortix was entirely stable during my time using it. I only spent a couple of days playing with the system in my spare time, but I never saw the operating system lock up, glitch or a program crash. For a one-person effort, the focus on having stable, working code impressed me. 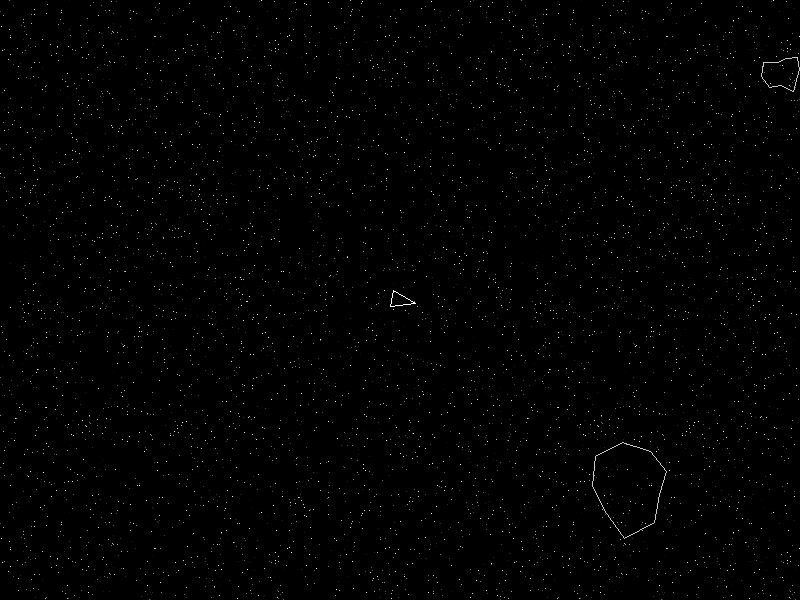 Sortix is a relatively new project, less than a third the age of Linux, and appears to be mostly a one-person development project. To me, this makes the progress made so far amazing. The system has a working installer and partition manager, it works with multiple file systems, has a working collection of ported GNU tools and can run graphical games. 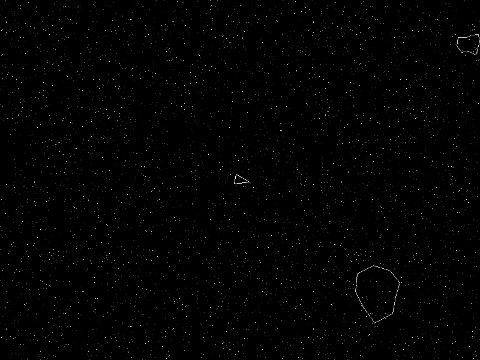 It's quite a feat of coding to get all of this working in so short a time. What really impressed me though was that the operating system's documentation (exploring what it does, what it does not yet do and how the pieces work) is clear and up to date. In that regard a lot of other open source projects could follow Sortix's example. Unfortunately, at this time, Sortix is not a practical operating system for most scenarios. We can test it, develop code on the platform and learn from its design, but Sortix lacks networking, multi-user security and a working desktop environment. This makes the project more of a developer playground than a system for end users to run. Still, in the realm of a personal hobby project, Sortix is one of the coolest creations I have seen in a while. The LibreELEC project is growing and supporting a wider range of devices. With this expansion comes the need to build and test a larger number of installation images. As a result, the project is looking for help in maintaining its expanding collection of images. "The project needs help. We would like to start releasing new images for a number of Amlogic and Rockchip devices including long talked-about (and needed) generic catch-all images, but this has a major impact on project resources. LE 7.0 released 8x images, LE 8.0/8.2 has 11x images, and LE 9.0 increases output to 22x images with another increase on the horizon once Allwinner support becomes possible and NXP (iMX) support is re-added. Increased output impacts our build server/slave capacity and requires us to rethink how our images are tested. It also affects our human resources." Information on the resources the project is looking for to help expand its support can be found in this blog post. The Raspberry Pi computer may have got its start in hobbyist and educational environments, but its low cost and low energy consumption have made it popular in other areas. This has led some organizations to seek commercial support for operating systems running on the Raspberry Pi. SUSE is now offering official support for SUSE Linux Enterprise on Raspberry Pi boards. "When SUSE created a Raspberry Pi image for SUSECon in 2016, there was a tremendous amount of interest. We saw thousands of downloads in just the first few days. Many people asked, 'When are you going to offer real support for the Raspberry Pi?' The answer is: now! Increasing customer demand drove our decision to offer commercial support for the Raspberry Pi to SUSE Linux Enterprise Server for ARM (SLES for ARM). A number of large companies decided to use Raspberry Pi based monitoring solutions in their industrial manufacturing operations." More information on SUSE's support for their Pi images can be found in the company's announcement. The openSUSE developers are looking at ways to make software updates smoother and less likely to break existing functionality. This is especially important on servers where administrators need their operating system to be reliable, but may also need to apply regular security fixes. openSUSE's approach to fixing this problem is called Transactional Updates and it allows new updates to be installed in a separate file system snapshot which can be activated when the computer reboots and rolled back if anything goes wrong. "Under the hood, we have worked hard to keep Transactional Updates simple. We are utilising the same Btrfs, Snapper, and Zypper technologies we know and trust by default in openSUSE and SLE. At its heart, Transactional Updates does something very similar to our traditional snapshots with rollback. But with Transactional Updates it never touches the running system. Instead of patching the current system, the transactional-update tool creates a new, empty, snapshot. All of the operations required by the update are carried out into that snapshot, ensuring the current system is untouched with no changes impacting the running system. At the end of the update, assuming the update is successful, this completed snapshot is marked as the new default. These updates then take effect when the system is rebooted." The announcement also mentions openSUSE 15 will offer an optional read-only root file system than can be updated with the transactional-update tool. The Python scripting language, which is popular for its relatively clear syntax and many convenient libraries, is roughly divided into two dialects - Python 2 and Python 3. While the two dialects are very similar, there are differences which make it tricky to upgrade older Python 2 code to Python 3. This may soon be a problem because Python 2 will no longer be supported by its developers after the year 2020. Linux distributions have known this for a while and have been trying to get Python packages all migrated to Python 3 in time. However, a lot of work remains to be done and distribution maintainers are wondering what to do about it. Fedora still has over 3,000 packages depending on Python 2 and there is some debate as to how to best handle the situation. Jake Edge has a deeper look into the situation and potential solutions in this LWN article. The SparkyLinux project is well known for having many editions and multiple development branches, providing potential users with over a dozen different download options. According to a post on the SparkyLinux website, the distribution is about to be streamlined. "I have to cut the ISO numbers down and focus on one, main point of Sparky view/core. The point was and still is Openbox. So, to conclude and make it clean and straight: 1. From now, only one main, Openbox based desktop: LXQt (rolling) or LXDE (stable). 2. MinimalGUI (Openbox)/MinimalCLI (text based) lets you install your favorite desktop with a small set of apps, as before. 3. Special Editions with no changes (so far) with Openbox, as before. It lets me find a little more time to make and focus on new Sparky releases better than before." Searching-for-a-package-that-works-everywhere asks: Portable applications are getting talked about a lot, but where can we find them? I can't just do a "apt-get install Flatpak-app" to get Flatpak apps. Where can I go to find Snaps and Flatpaks? DistroWatch answers: Depending on which distribution you are running, Snaps and/or Flatpak packages may be accessible through your distribution's software manager. Recent versions of Linux distributions which use GNOME Software or mintInstall typically already support downloading Flatpak packages or Snaps from within the software manager, which makes finding and installing portable packages quite easy. Applications which offer their users AppImages or other portable packages usually list them on the upstream project's download page. The Krita and the QupZilla projects provide links to their AppImage packages, for example. However, if you are browsing without knowing exactly what you are looking for, then there are resources available for getting an overview of available portable packages. People looking for Snap packages can use their distribution's snap command line utility. For instance, running "snap find media" will bring up a list of multimedia Snap packages such as VLC and MPV. People who wish to browse available Flatpak packages can check out an on-line repository located at Flathub. Flathub collects Flatpak packages and provides click-to-download and command line instructions for installing the applications in the Flathub repository. Users who want to find AppImage packages can use a similar resource called AppImageHub. The AppImageHub website lists applications in alphabetical order with an accompanying description. The AppImage packages can be downloaded with just a couple of clicks. OpenBSD is a security-focused operating system with a focus on correct code and accurate documentation. The project has released OpenBSD 6.3 which introduces SMP support on the ARM64 architecture, includes ISO support in the virtual machine daemon (vmd) and makes memory allocation more efficient. There have also been several updates to the LibreSSL and OpenSSH secure communication tools: "LibreSSL 2.7.2 - Added support for many OpenSSL 1.0.2 and 1.1 APIs, based on observations of real-world usage in applications. These are implemented in parallel with existing OpenSSL 1.0.1 APIs - visibility changes have not been made to existing structs, allowing code written for older OpenSSL APIs to continue working. Extensive corrections, improvements, and additions to the API documentation, including new public APIs from OpenSSL that had no pre-existing documentation. Added support for automatic library initialization in libcrypto, libssl, and libtls. 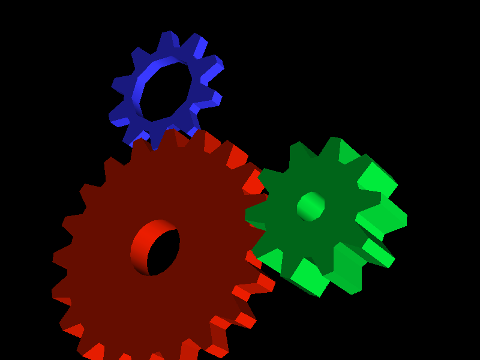 Support for pthread_once or a compatible equivalent is now required of the target operating system. As a side-effect, minimum Windows support is Vista or higher." The release announcement has more information. NixOS is an independently developed Linux distribution which is configured and managed using the Nix package manager. The NixOS project has released a new version, NixOS 18.03, which includes version 2.0 of the Nix package manager minor upgrades to the GNOME and KDE Plasma desktops along with several new services. "In addition to numerous new and upgraded packages, this release has the following highlights: End of support is planned for end of October 2018, handing over to 18.09. Platform support: x86_64-linux and x86_64-darwin since release time (the latter isn't NixOS, really). Binaries for aarch64-linux are available, but no channel exists yet, as it's waiting for some test fixes, etc. Nix now defaults to 2.0; see its release notes. Core version changes: Linux: 4.9 to 4.14, glibc: 2.25 to 2.26, gcc: 6 to 7, systemd: 234 to 237. Desktop version changes: GNOME: 3.24 to 3.26, (KDE) Plasma Desktop: 5.10 to 5.12. MariaDB 10.2, updated from 10.1, is now the default MySQL implementation. While upgrading a few changes have been made to the infrastructure involved." Further information can be found in the distribution's release notes. NixOS is available in a full Graphical edition running KDE Plasma and a Minimal edition which features a command line interface. How long have you been running the same distro? The Linux ecosystem is full of diversity with many options to choose from. Some people like to take advantage of this variety, switching distributions and trying different technologies on a regular basis. 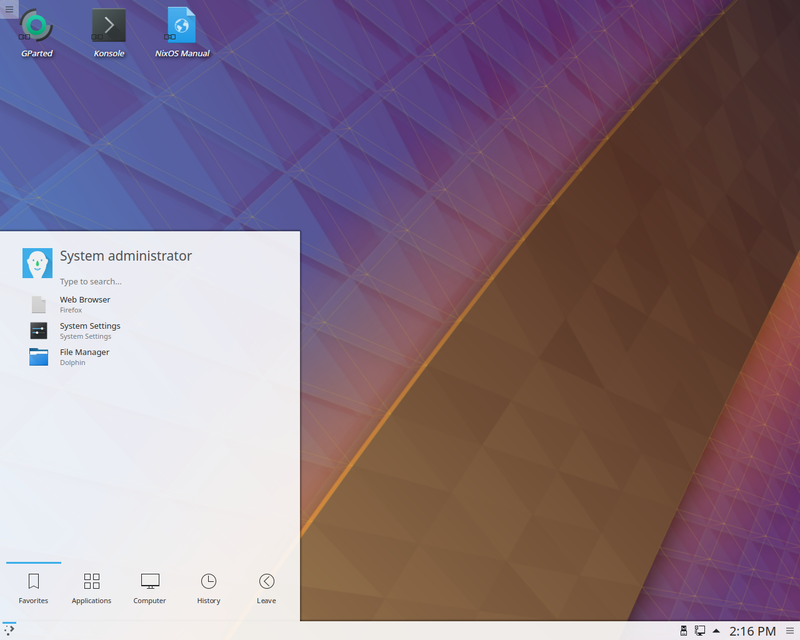 Others prefer to settle into using one distro for long periods of time. This week we would like to find out how long you have been running your current distribution. You can see the results of our previous poll on learning Linux from books in last week's edition. All previous poll results can be found in our poll archives. SoNebuntu. SoNebuntu is Linux Distribution based on Ubuntu 16.04. SoNebuntu contains useful tools for a Social Network Analyzer (SNA) and Information Collector. Beside, it has development environment for building apps for SNA and tools needed for researchers. SuperGamer Linux. SuperGamer Linux is a spiritual successor to SuperGamer. While the original SuperGamer was based on VectorLinux and featured open source games exclusively, the new project is based on Ubuntu and features gaming options from GOG and Steam. EzPlanet One Linux was a Fedora-based Linux distribution tuned for enterprise solutions. EzPlanet One integrates advanced technologies, flexibility, high availability, security, quality. Built with the enterprise in mind, it features also several tools for the professionals and individual users that make its use more fun. Most of the latest advances in technologies available for Linux have been included in the EzPlanet One distribution. For example it supports most wireless network adapters, including those that do not have specific Linux drivers. EzPlanet One was ready to be used for your server infrastructure and your desktop clients. Quality was the secret of a robust and unbreakable foundation for the technical architect, with the tools and the ease of use to suit system administrators, bank managers, personal assistants, chief financial officers and beginners.